This logo of YLE Radio Finland was used for some ten years from the early ´90s. Those were also the peak years of marketing world band radios as an essential companion to travellers. Based here on a photo from a poster the logo is not seen in all detail. These pages feature information about Finnish international broadcasting services in 1938-2006., This is not a YLE publication, but a private media history site. The writer, Mr Juhani Niinistö worked as Head of International radio at YLE for decades, until leaving YLE in 2005. A detailed timeline of the ups and downs of the Finnish International Service here. Number of languages used varied, at the height there were seven languages. Bulletins in English and French produced at the Foreign Ministry Radio Service Unit were broadcast on YLE. The Ministry closed the service in 1958. Some radio enthusiasts got permission from YLE to produce programming in English. YLE launched a modest daily English service. English programming was developed and expanded. YLE resumed German service (had been closed in 1945). YLE and the state financed jointly a new SW broadcasting station in Pori (western Finland). YLE begins "Special Finnish", at slow speed. YLE launched availability of radio on satellites. By 1997 the service covered the globe, except South America. Placement of YLE foreign language programming mainly in Russia, Canada, Germany and Australia. YLE added weekly bulletins in languages related to Finnish, such as Udmurt and Mari, spoken in Russia. YLE closed down international services in English, German and French. Russian and the small Finno-Ugric languages continued. With the closing of SW the remaining foreign language programmes and Special Finnish continued on satellites and internet. "Finland is a democracy in the western sense of the word"
"Northern Report" covered Finland and the North for an international audience. Read about the ins and outs of covering Finland for western audiences during the last two decades of the cold war. Northern Report, also known later as Compass North, entered the international airwaves in a situation where Stockholm had been the place for covering the North for the world, also in international broadcasting. 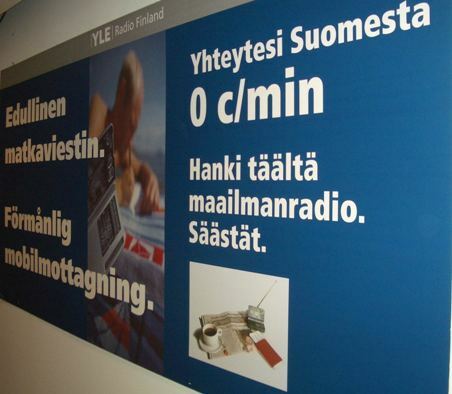 In October 2002 YLE Radio Finland broadcasts in English, German and French were closed. Domestic news in English and the Russian service continued. There was not much of a response to the closing internationally, except for the German service and the YLE presence on CBC Overnight in Canada. CBC Radio One had been relaying YLE in its night format since 1996 and a half hour of English from Finland had become a regular part of the night schedule. The fact that audience response to the closing of the German service would stand out was no surprise. The language service had been the best part of Radio Finland, in terms of audience relations. The Press Section of the Ministry of Foreign Affairs had made an attempt to influence the decisions of YLE. With no impact though. The services had been financed totally by YLE on the basis of its licence fee recenue. The Ministry had no official role in the service. When YLE resumed English language broadcasts in 1967, limited government funding had been made available to YLE and the sums had been paid annually. But in the early 70s YLE had not filed applications any longer and the budget item was withdrawn. Theoretically, if the small public funding had survived until the early 2000s, a decision to close down foreign language external radio perhaps would not have been that easy. International broadcasting was a sector where your closest colleagues could be in another country. There were "alliances" of stations on the international broadcast scene formed on somewhat political lines. Thus, Voice of America, the BBC and Deutsche Welle were co-operating as the big three. Then there was “Group of Six” including Radio Nederland, Radio Sweden, Swiss Radio International, Radio Australia, Radio Japan and Radio Canada International. Radio Finland was not in any grouping. Admittedly, there were Nordic SW meetings, but they did not constitute much more than a framework for Sweden establishing that it was biggest, until the fast expansion of Radio Finland in the 1980s. There was "no group of Nordics" in international broadcasting. Of the five Nordics, only Finland and Sweden maintained daily broadcasts in foreign languages. The relationship between Radio Finland and Radio Sweden became increasingly competitive as the Nordic political scene was seen somewhat differently from Stockholm and Helsinki. Within the large broadcasting unions such as EBU, international broadcasting (or external) did not have much presence for decades, except on the technical side. It was not until the late 70s that initiatives were taken to change the situation. The idea was to establish a forum within the EBU to share and solve problems that external broadcasters had in common. The plan – originally from the Director General of Radio Nederland, Joop Acda - got intense support from the Director General of Radio Vaticana Pasquale Borgomeo, S.J. Juhani Niinistö of Radio Finland was very keen on getting something launched, as Radio Finland was outside all the existing groupings. 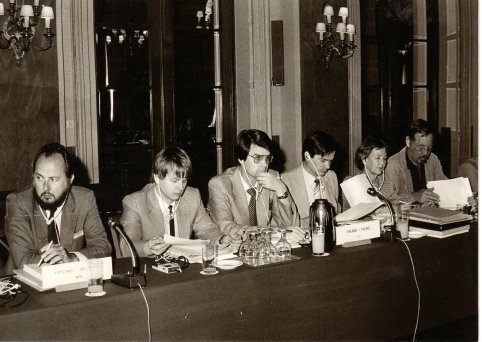 The creation of a space for international radio within the EBU was debated in three meetings of the EBU Programme Committee, in Istanbul 1980, Athens 1980 and Lisbon in 1981. Juhani Niinistö attended all three - and was able to promote the idea even though the YLE corporate level had reservations as such involvement in such a grouping could entail political risks, with a view to the neutral position Finland pursued. Yle actually voted blank in the final vote about the plans to create an international broadcasting plenary meeting, but Yle Board Members explained at the same time that Finland would participate in the upcoming meetings. After approval of the plan in Lisbon, the first preparatory meeting took place in Geneva in June 1982. Plenary meetings continued then to be arranged then at roughly 18 month intervals. In the late 80s YLE became a member in the “small group” or "steering group" that met more often and discussed upcoming issues. The group often met in Vatican City. YLE was a member in both the Soviet bloc broadcasting union OIRT and the Western union EBU. OIRT was actually the original European broadcast union. At the start of the Cold War the West had pulled out of OIRT, but YLE had remained. Even though YLE was active in many OIRT working groups, the OIRT external broadcasting working group never invited YLE Radio Finland. There was one invitation inthe early 80s, actually, a telex in Russian, but a cancellation came the next day in German. Had YLE Radio Finland been obliged to participate in OIRT working groups and air OIRT campaigns, it would have risked its credibility. YLE representatives at the EBU Programme Committee meeting in Lisbon that took the final decision to accept the establishment of an international broadcasting forum in the EBU. From the right Paul v Martens, Programme Director of Swedish language YLE radio, Liisi Lahtonen, a specialist in International Relations, Jouni Mykkänen, Director of YLE Radio 1, Keijo Savolainen, Programme Director of YLE Radio 2, Juhani Niinistö, Head of YLE International Radio. On the left there is Joe Gwathmey from the US National Public Radio. "Listen to radio from Finland at the rate of zero cent per minute..."
From the mid90s onwards, YLE used the language of the contemporary advertising of mobile media in its promotion of world band radio - as seen here in an ad prepared for the annual Travel Fair in Helsinki in 2001. The campaign positioned the easy and cheap world band radio against the costly use of mobile phones outside the home country. The target group were Finnish tourists abroad. The campaign was fairly succesful and sales of world band radios increased in Finland. Tourists soon rediscovered world band radio as a way to avoid the invoices that had been awaiting them on arrival from recent trips at home. Marketing was eased through the all-day availability of Radio Finland in Western Europe: 11755 and 6120 kHz gave an almost complete coverage from Germany to the Canaries from morning till late night. When 11755 faded, 6120 opened. The Finnish service of Radio Finland for Western and Southwestern Europe was not a typical block broadcast of a limited duration, but an all day service, like domestic radio. Live sports - such as ice hockey - was part of the service. The slogan was phased out in 2003 as it had been established within the company to give "conflicting marketing signals". The decision must be understood against the backdrop of the increased interest of YLE at the time in the mobile handset media. The slogans lived on some more years though as part of a compaign by expatriate organizations to bloc plans to discontinue world band radio from Finland. The efforts to even slow down the plans of YLE were futile, and YLE went ahead and closed down SW and phased out specialized journalistic services for Finns abroad. YLE Radio Finland appears to have been the first international broadcaster to open an 800-line (toll free) in the US, and later in Canada. Done in the very early 80s the move had an expensive look, though the cost actually was not that high. The calls never reached Finland, but an answering system at the office of John Berky, the YLE Radio Finland audience and distribution representative in North America. From mid 80s, Radio Finland started arranging audience events in target areas and participating in expatriate festivals. The first such visibility was arranged by the German service in 1986.
rose and fell the quickest"
A German media student wrote in 2009 a thesis about YLE Radio Finland, Radio Sweden and the Swiss International Service in comparison. Read here.